On personal, institutional, and global scales we’re often told that sustainability is our ultimate goal. Universally defined, sustainability aims to ‘meet present needs without compromising the ability of future generations to meet their own needs.’ This is undeniably a noble mission, but when push comes to shove, does sustainable development have what it takes to engage society with the appropriate tools to tackle the pressing challenges we face? An increasing number of people are recognizing that it does not, that efforts should be made to better capture our potential to not merely sustain or survive, but to thrive into the future. This, in essence, is exactly what thrivability aims to do. To properly understand thrivability, it is helpful to take a deeper look into the modern sustainability discourse, and why it has been falling short of its intended goals. 1. Austerity-Based Messaging is Disengaging: The core of the sustainability movement is about acknowledging that we’re in a hole, a crisis situation, in the negative – it aspires to get us back to zero. To achieve this goal, sustainable development has focused primarily on reducing detrimental impacts, with far less emphasis being placed on what can be gained from preferred activity. This has turned out to be a limited and ineffective strategy for changing peoples’ behaviors as countless individuals, businesses, and communities feel it compromises their growth and infringes on their free will. Essentially, sustainability has been promoted as mostly stick and very little carrot, and the result has been high levels of polarization, resistance, and disengagement that has stifled and stalled progress. 2. Segmented and Ineffective: Building upon this, sustainable development has exposed a significant blind spot by failing to acknowledge the connectivity and interdependence of the various issues encompassed within our pressing 21st century challenges. Progressives frequently site a growing number of global crises that require unique and urgent attention, from energy, food, water, and waste crises, to economic, infrastructure, and carbon crises. All of these crises have received a significant amount of attention over the years, each with their own institutions, NGOs, conferences, websites, funding mechanisms, etc. The work happening here is incredibly well intended, but the concern is that by approaching these issues in isolation of each other, we fail to acknowledge a deeper systemic understanding of how they all relate to each other, or what may have caused them to develop in the first place. The result is redundancies and ineffective strategies that often exacerbate problems elsewhere. 3. An Insufficient Goal: Lastly, and perhaps most importantly, sustainable development and its mission of eliminating ‘unsustainability’ is an inherently insufficient target for success. For over 30 years now, human demand for ecosystem services has outpaced the planet’s ability to reabsorb and replenish them. It is frequently cited that we now need over a planet and a half’s worth of services each year, and projections show that demand for resources will somehow increase in the decades ahead. Under sustainable development’s target of zero impact (carbon neutral, net zero, etc), lost ecological systems and prior developmental impacts are generally unaccounted for. In other words, if we were to stop ‘being bad’ today and live impact-free, truly ‘sustainable’ lifestyles, we’d be living on a severely degraded planet that has already shown signs of significant imbalance. The active restoration and regeneration of the biosphere to a stable equilibrium needs to be accounted for, and sustainable development as it stands does not do this. Thrivability is a burgeoning developmental model that is currently being brought to life by a network of social innovators, living systems specialists, and change agents throughout the world. It is a positive and inclusive vision that steps away from messages of austerity, burden, and sacrifice and into a mentality that empowers people to take on the deepest societal problems with courage and enthusiasm. It is founded upon the premise that thriving is not something that just happens to inspired individuals, but it is something that can be actively designed into organizations, communities, and entire cultures. To do this, a ‘thrivable’ designer focuses less on identifying and fixing problems and more on creating and strengthening conditions that provide the greatest opportunity for individuals, organizations and communities to to evolve, express themselves authentically, and operate in a mutually enhancing manner with their broader ecosystem. In this light, thrivability’s approach to development is salutogenic, akin to a doctor helping a patient live a stress-free, meaningful, and healthy lifestyle, as opposed to a pathogenic approach that prescribes medications for diagnosed ailments. Thrivability builds on itself. It is a cycle of actions which reinvest energy for future use and stretch resources further. It transcends sustainability by creating an upward spiral of greater possibilities and increasing energy. Each cycle builds the foundation for new things to be accomplished. Thrivability emerges from the persistent intention to create more value than one consumes. When practiced over time this builds a world of ever increasing possibilities. Because of its dynamic nature, thrivability cannot be approached so much as a destination as an ongoing process of adaptation, learning, and action. It places considerable emphasis on the link between intrinsic motivators and external outcomes, acknowledging that effective change must be internalized and embodied before it can spill over and influence broader scales. The more you optimize elements of a complex system of humans and nature for some specific goal, the more you diminish the systems resilience. A drive for an efficient optimal state outcome has the effect of making the total system more vulnerable to shocks and disturbances. 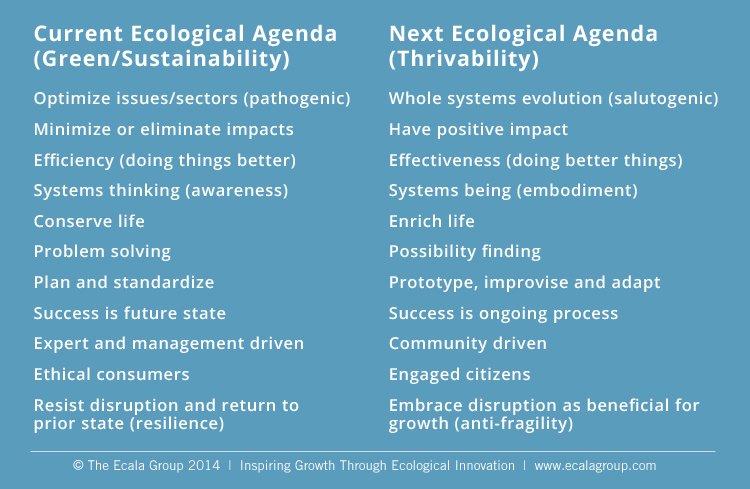 In an effort to concisely capture the core differences between thrivability and green/sustainable development mentioned throughout this article, I devised the following graphic. But is Thrivability Really Necessary? The thrivability movement is certainly compelling, but it is quite young and many people are tussling over its role within the broader social and environmental spaces. Some love it and dive in head first, while others have resisted it (particularly those who are established in the sustainability space) feeling the differentiation between sustainability and thrivability may be confusing or not entirely necessary. In response to this latter point, it’s important to note that thrivability’s intention is certainly not to replace sustainability, whose efforts to reduce and eliminate our detrimental activities are as important today as they’ve ever been before (think fossil fuel and chemical usage, ecosystem degradation, social inequity, etc). Again, the necessity and value of thrivability lies in its ability to shift our assumptions, beliefs, and perceptions of success into a more aspirational, engaging, and positive light. This is vitally important as our scientific and media outlets have been making it clear that the 21st century will be ripe with turbulence and disruptions. Well, it’s been said that we move towards what we picture in our minds. If the only picture we are shown is that of a future worse than the present, then it’s no wonder why people resist change. Thrivability paints an entirely different picture. Its message of conviviality, connection, and enrichment serves as a beacon that can pull us towards our best potential. It is poised to rekindle a creative fire that has been seemingly smothered within the modern sustainability movement (think 100-point checklists and marketing buzzwords) and can serve as an important evolutionary step in our socio-ecological development. We agree about the need to move to a focus on thrivability. Any chance we could chat about reposting a portion of this to our site, http://www.axiomnews.ca? Very inspiring and good article about the neccesary for a another discours then sustainability! Maybe this article below is also interesting, where Tom Bosschaert, director Except, explain why knowing what ‘sustainability’ means exactly is so important. He discuss problems with old definitions, explain the new SiD definition of sustainability, and what it empowers us to see, do and discover. Kind regard and keep up the good work! Brilliant… and it reminds of an even more simplified version of this idea I heard just the other day : Sustainability is about ‘staying in the game of evolution’. Ah, and also just remembered another connection. One of my buddies just emailed me a link to a TEDx presentation led by Eva Gladek, who was talking about the work being done at Except… very inspiring! On the happiness, personal development-inspired side of thngs, these are ideas I’ve been following with “The Ecology of Happiness” – http://www.beyond-eco.org. Gerald, happy that you found this piece! Ironically, just came across your own site other day and really resonated with its message and approach. Is it primarily a blog/communication platform or is it representing applied projects? I have been working with Jeff Vander Clute to bring forth the Thrive meme as a broader context which includes sustainability. Your article and slide show are an excellent frame of the conversation. I have worked in sustainability for over 25 years and it has been a tough sell even in the face of peoples best interest. I was drawn to Thrive as a broader context to frame the conversation and like you am concerned that it will lose it’s power just as sustainability has lost it’s true intention. 1 [ no obj. ] (of a person, animal, or other living organism) grow or develop in a healthy or vigorous way, esp. as the result of a particularly favorable environment: wild plants flourish on the banks of the lake. • develop rapidly and successfully: the organization has continued to flourish. • [ with adverbial ] (of a person) be working or at the height of one’s career during a specified period: the caricaturist and wit who flourished in the early years of this century. 2 [ with obj. ] (of a person) wave (something) around to attract the attention of others: “Happy New Year!” he yelled, flourishing a bottle of whiskey. 1 a bold or extravagant gesture or action, made esp. to attract the attention of others: with a flourish, she ushered them inside. • an instance of suddenly performing or developing in an impressively successful way: the Bulldogs produced a late second-half flourish. • an elaborate rhetorical or literary expression. • an ornamental flowing curve in handwriting or scrollwork: spiky gothic letters with an emphatic flourish beneath them. 2 Music a fanfare played by brass instruments: a flourish of trumpets. • an ornate musical passage. • an improvised addition played esp. at the beginning or end of a composition. that adds another dimension to the conversation that will strengthen it’s ability to hold it’s true meaning over time. We need to develop rapidly and successfully. Also we need to wave something around to attract the attention of others; a bold or extravagant gesture or action, made esp. to attract the attention of others: Music a fanfare played by brass instruments and an instance of suddenly performing or developing in an impressively successful way. To flourish will require us to add the dimension of celebration to the conversation. To strike up the band to call us to action so that we can develop rapidly and successfully. Keep up your good work. I would love to talk with you in the near future. Fantastic Larry! Thanks for your great contributions here ; ) Yes indeed, thriving and flourishing are two peas in a pod. At this point, my interest is with yours, developing successfully (and as rapidly as possible), using principles and processes that are mutually enhancing (human culture and ecological systems). What have you and Jeff been doing to promote this mentality and approach? Would love to hear what you’ve been up to!